Professional & Powerful Mind Mapping Software | Download PowerPoint Mindmap now! ConceptDraw MINDMAP is a professional business software that meets your presentation needs. You can effectively generate, change, and update your mindmap and then show it as presentation, print, export to Word and PowerPoint, make the Project files for MS Project and ConceptDraw PPROJECT. Sample 1. 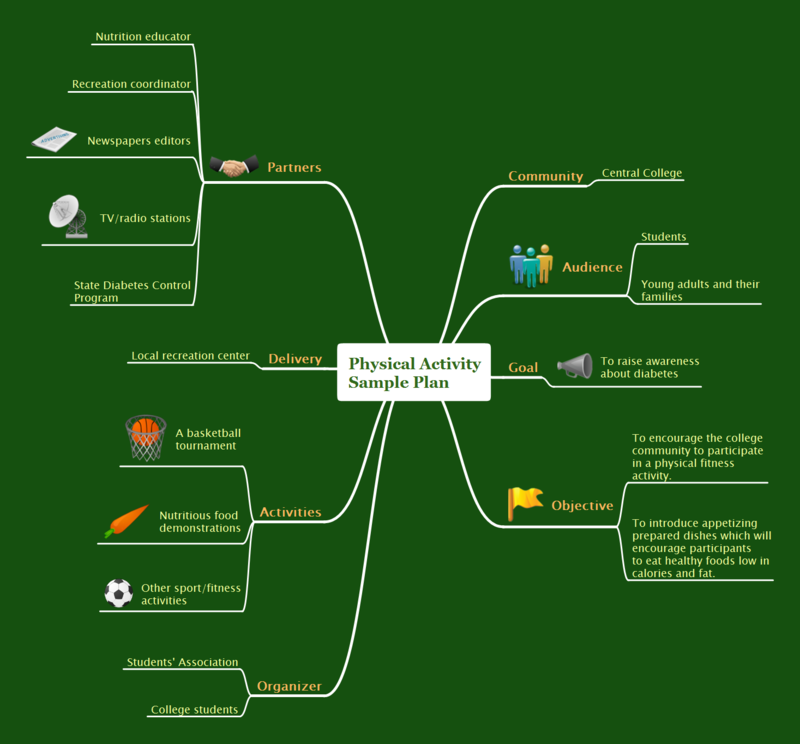 Mindmap presentation - Physical activity plan. An advanced tool for creating presentations, if you decide to represent data without spending hours on that. ConceptDraw MINDMAP v10 - an excellent tool for exporting mind maps to PowerPoint to visualize and presenting your project. You can simply generate, change, update your mindmap and then make a presentation in PowerPoint. ConceptDraw MINDMAP v10 with the ability to import presentations from Microsoft PowerPoint, as well as enhancing its existing presentation capabilities. Create value stream maps - for value stream analysis and value stream management, material and information flow mapping, using our quick start templates included with ConceptDraw. How to make great presentation via Skype? ...how it works with ConceptDraw MINDMAP v10 ? MindMap Presentation via Skype, brainstorming and organizing ideas. Create and present Mind Maps using software. The presentation via Skype conference call is part of solution Remote Presentation for Skype - from ConceptDraw Solution Park. It let presenter to control over the slide-show process which plays on each computer of conference call participants synchronously. Picture: How to make great presentation via Skype? ...how it works with ConceptDraw MINDMAP v10 ? Professional Mind Mapping. ConceptDraw MINDMAP v10 professional software to create documents. Mac and PC compatible. MS Office Exchange Solutions. Skype Collaboration. Presentation Tools. Creating and organizing presentations, structuring received presentations, presenting mind maps, and preparing for public presenting. ...how it works with ConceptDraw MINDMAP v10 ?